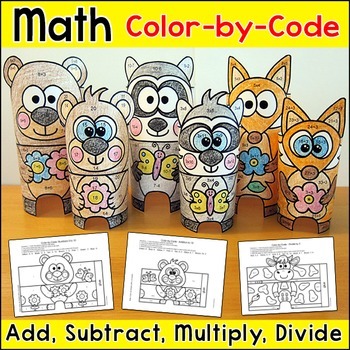 Practice number matching, adding, subtracting, multiplying or dividing with these fun Spring Animal Babies and Mothers color by number pictures that turn into a 3D paper toys! This activity is perfect for math centers, morning work, early finishers, substitutes or homework. 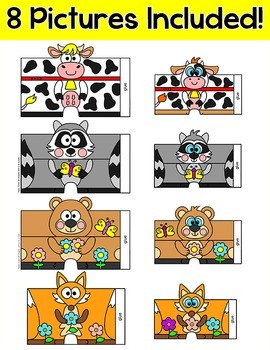 This product includes 8 pictures: Cow & Baby, Raccoon & Baby, Bear & Baby, Fox & Baby. 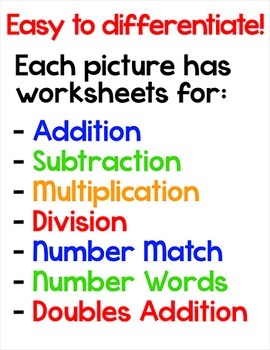 Each picture has 33 worksheets for the following skills: matching numbers to 20, number words, addition to 20, subtraction within 20, doubles addition, doubles + 1 addition, multiplication from 1 to 12 and division from 1 to 12. You can choose the most appropriate question set for your students which makes the activity perfect for differentiation and many grade levels. When students have completed their characters, display them on a table or hang them from the ceiling for a fun and eye catching Spring display. Students will be excited to take them home and show their parents. When coloring is completed, cut out the picture and then apply stick glue to the “glue” area. 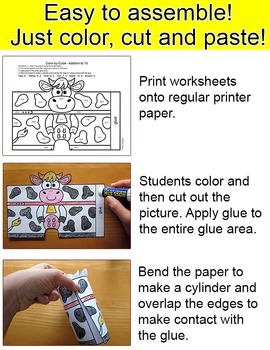 Bend the picture into a cylinder and then overlap the edges so that the glue makes contact with the paper. Tape or a stapler also work well if you prefer not to use glue. You may like my other Color by Code 3D Characters Activities.